One wedding trend I wish I could have known about when hubby and I were planning our wedding 7 years ago is the thumbprint tree guestbook so if you’re still preparing for yours, well then good for you! 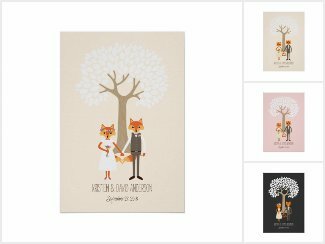 Fingerprint tree posters provide a fun and creative way for your cherished guests to (literally) leave their mark and they also make precious keepsakes of the day you became husband and wife. If you want to get your hands on a stylish and artistic fingerpint tree guestbook, check out what Etsy store Love From The Thumb has to offer. Shop owner Ricky Raleigh – a new husband himself! – told me that he designed his and his wife’s guestbook for their wedding last year. It became a hit that they decided to open a shop to sell them in. We started out 6 months ago when we were thinking of what we wanted to use as a guestbook for our wedding. We wanted to have something that we would actually look at and enjoy and not just take up space on a shelf some where. After many iterations we finally agreed on the final design for our tree. It was a huge hit with all of our friends and family and we were asked by several people if we would create trees for them. Fast forward a few months and we finally decided to take the plunge and try to open an Etsy store and see what happened. I thought eventually we would sell one or two but to my surprise orders began flowing in almost immediately! We have only been doing this for less than a month but its been an amazing experience thus far and we cannot wait to see what the future holds for Love From The Thumb! The Thumbprint Trees come blank with just your names and date, ready for your friends and family to fill with their fingerprints and signatures. Custom Home Family Tree Artwork, what a great idea huh? We offer guestbooks for weddings, bridal showers, baby showers, birthdays, reunions, anything really! We have many more designs coming out soon that we just haven’t had the time to get in the store. Our newest item is a custom portrait of your home that can be used for housewarming, your first place together or commemorate the start of your family. How cool is that? Thank you for sharing your art with Poptastic Bride’s readers Ricky and good luck with your store! I considered this as a guestbook option, but almost immediately dismissed it. It’s cute! But all I think of when I look at them is what if something happens to someone who put their thumbprint on your wedding tree? I was having nightmares of the police showing up at my door asking to see my guestbook so they could identify a body. NOT COOL! I am planning my wedding now and think this is a creative and beautiful idea. I know everyone has a right to their opinion, but thinking that you would have to identify a body is a bit morbid and really to bad that it would keep you from having a beautiful memory of your wedding hanging in your house. I love this idea and will definitely be having my very own Fingerprint guest book at my wedding!! wedding gifts in the UK. They are really unique :0) Love the blog, too! I love this Idea. I am having a very budget wedding and this would be something that can help me save and incorporate both families. traditional weddings, have you wait in line to sign the book, and you just usually sign your name, congrats, smiley face and keep it moving..but im going to do this!! i cant wait.. i have a peacock wedding and ill have a Peacock THumbprint Guestbook.. it will be beautiful!! I CANT WAIT!!! –ok, craft time! !